As Bike Week comes to a close we present a list of 10 great blogs that cover bikes as the fantastic form of transportation that they are. Sure bikes are fun and make for a great workout – but they also happen to be an easy and eco-friendly way to get from point A to point B. Kids know this, but adults seem to forget and think the only way to get around is in a gas-guzzling motor vehicle. This list of blogs proves that grown-ups can ride to work and play without shame, and maybe even with a little bit of style. Note: a few local bike blogs (SoapBox LA, BikingInLA and LA County Bicycle Coalition Blog) have been left off this list because they already appear on our 10 essential Los Angeles transportation blogs list. A beautiful blog that sets out to show that a bike centered lifestyle is not only good for the environment, but brings joy to the soul. 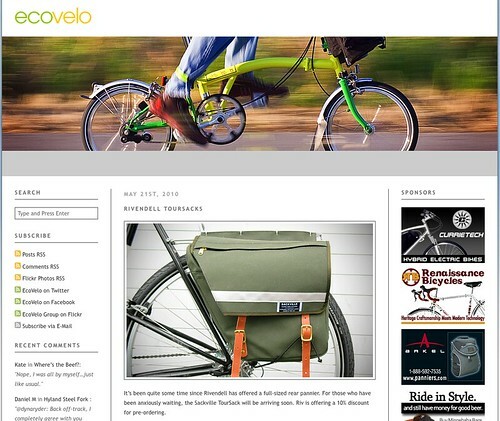 With multiple postings each day – featuring gorgeous photographs and well written articles on bike culture, lifestyle, technology and fashion – this blog is a must follow. In our car-centered society getting to work by bicycle can be a bit revolutionary – and a bit intimidating for many folk. This blog offers tips, anecdotes and reviews of bikes and gear that make the whole bike commuting thing seem a little less crazy. Frequent posting makes Commute by Bike an essential bookmark. Another bike commuting blog, this one offers news, reviews and how-to’s on getting to work using pedal power. Check out their commuter tools that offer bike laws for every state, a gas savings calculator and and MPG calculator for those who combine a car commute with bike commute. In addition to having a pretty great name, Cyclelicious has a non-stop posting schedule on everything and anything to do with bike culture. The blog covers nationwide bike events and new stories relating to bikes as transport. One cool regular feature are posts that spotlight famous folk who use bikes to get around. Like so many things, there’s a feeling in society the bikes are a guy thing. Well this blog is all about getting more people – especially women – on bikes. It’s a great looking and super readable blog with articles that will appeal to any bicyclist but there’s plenty of posts that shine that light on issues women might face when it comes to getting around on a bike (see: Wardrobe Malfunction: Stapling My Skirt). Local and outspoken – Bikeside LA is a blog that tackles policy issues that affect the bikes as transportation lifestyle in Los Angeles. Posts cover local bike news, advocacy issues and local agencies and officials who may be standing in the way of L.A.’s bike culture. Another local blog covering the progress and setbacks in L.A.’s journey to becoming a bicycle friendly place to live and ride. Posts are meaty and thought provoking – and often accompanied with great pictures. Opinion on local politics affecting bike culture represents the bulk of postings. Portland, Oregon is often praised for its bike friendly land use policies and booming bike culture. In fact, 8% of commuters bike to work – the largest percentage of bike commuters in the U.S. Bike Portland has daily postings on what’s going on in that bike utopia to the north and can serve as a great inspiration as we try to up our paltry 1% bike commute mode share here in L.A.
Portland may be pretty impressive with its 8% mode share of bike commuters – but it’s nothing compared to Copenhagen’s 55%! To truly be inspired, we have to look to Copenhagen and Copenhagenize lets us do just that. The blog’s daily postings show just how great things are in Copenhagen and progress being made around the globe. The Guardian is one of London’s most read newspapers and its website is popular worldwide – and it has an entire section devoted to cycling. The site offers a great look into London’s bike scene and makes me wistful for similar coverage from the L.A. Times.